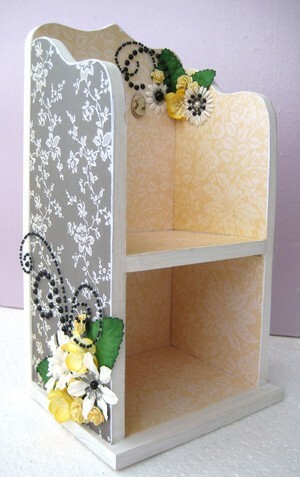 An altered object to a contest on svenskscrapbooking! It only took me about a year to get around to this project! I saw this supercute thing on Kaisercraft, emailed a pic to my mum and, tada! She made one for me out of wood! She also cut out a lot of 4"x4" wood pieces wich I will make into minialbums.. just give me another year or so..
to dress it. Mixed flowers and bling. Just had to make another LO with the january kit from the Nook! Emmas cute cute daughter! I really need to visit them soon!! I miss them both!